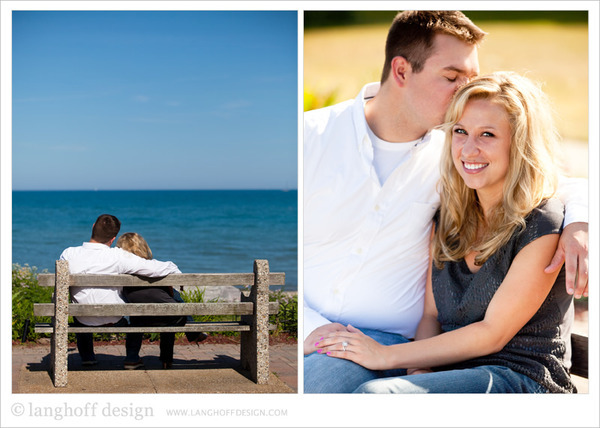 Sami and Drew met during their freshman year of college at Carthage, but didn't really cross paths until their “physical fitness” class together their senior year. Everyone in the class got 2 free skips. Drew and Sami, along with a mutual friend, decided to use one of their “skip” days to go out for sushi. The rest is history. Four years later, they are engaged to be married! They say, "Since our first impression, our love for each other has only grown. We still embrace the traits that attracted us to each other, but now we have so much more to love about one another." 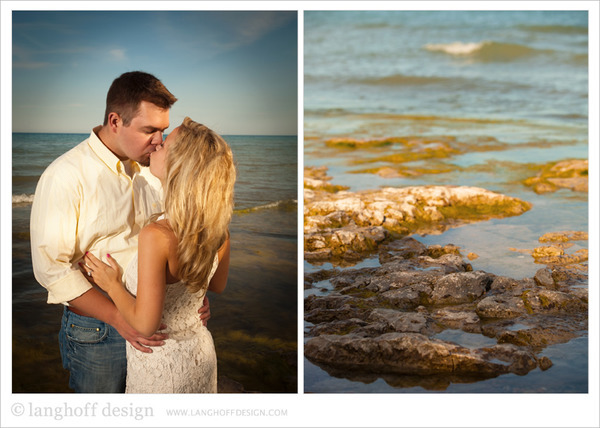 Check out these gorgeous photos from their engagement session at the Wind Point Lighthouse (Racine, WI) as you read about their funny traits, "bad luck curse" and their super-romantic proposal story. When asked what they like to do together, Sami and Drew responded, "EVERYTHING." They are best friends and are perfectly content whether out and about or just relaxing at home watching a movie. They especially love camping and go to a campground every summer in central Wisconsin. Also, Drew has turned Sami into a fisherwoman! Sami says, "We are usually on-the-go, and we love spending time with our friends, but we also love nights in. If we are together, we are happy." I'd say "happy" is an understatement...it was practically impossible for these two to stop smiling during this photo shoot! It is so clear that they love each other so much and bring joy into each other's lives. I asked Sami what her first impression of Drew was. I love her sweet response, "When I first spent time with Drew our senior year, I obviously thought he was very handsome guy. But, I really loved his sense of humor and that he was very laid back and easy-going. He made me so comfortable and I felt like I could just be me. Today, nearly four years later, I still love all these characteristics about Drew. Drew makes me laugh every day and my favorite part of the day is coming home and spending time with him." Drew's first impression of Sami is equally sweet! He says, "I saw a beautiful girl who loved to smile and laugh. Her sunny disposition and ability to make everyone around her feel comfortable and included immediately endeared her to me. The more I learned about her the more I wanted to know. I was also, and still am, attracted to her work ethic and capacity to balance a multitude of responsibilities." 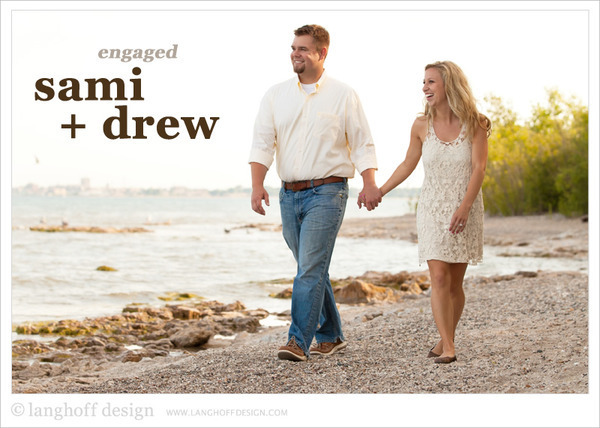 Just listen to Drew's proposal story! "It was really important for me to propose with the element of surprise. The difficult part was that Sami is so organized and makes most of our plans, and that if anything out of the usual was happening she would have figured out what was going on. So I proposed at our apartment when she got home from work on a Friday. Sami Parked in our garage. I had lined the garage with candles and flower petals with a long white runway going down the middle to the door into our apartment..."
"...On the door were letters that said 'WILL'. 'YOU' was on the wall just inside so once she opened the door leading down into our apartment she could read it. More rose petals and candles lined the stairs and on the wall read 'MARRY' at the landing at the bottom of the steps. Finally, she turned into the apartment where I had our song playing (Ben Folds, The Luckiest). I was in my suit at the bottom of the steps on one knee holding the ring. I said 'Me.' After 30 or so seconds of joyfully crying, she said yes. After that we went up to Milwaukee and spent the night at the Pfister in an Engagement package suite. We dined on exotic foods at 'beta by Sabor', and drank fancy martinis. It was an amazing night we will never forget." What does Sami love about Drew? Well, she couldn't narrow it down to one thing, but she says he is such an amazing man, and she's so grateful to know that in less than a year, he will be her husband! She loves that Drew is down to earth & genuine, that he makes her laugh, and that he's so smart (he knows more trivia than anyone she knows!). "My favorite thing about Drew, though, is his love for our relationship and me. Drew always makes me feel like I am truly loved and cared for. For example, when I was trying to juggle work, school, wedding planning and moving, Drew was so supportive. He not only put up with my heightened stress, but made dinner for me, helped get the housework done, and helped me in any way he possible could. I am so happy to know that I am with someone who I know will make me feel loved every day for the rest of my life." Regarding what he loves about Sami, Drew responded, "I too have a hard time picking one thing. But If I had to pick one that best includes all of the things I love about Sami, it would be how she shows me she loves me every day. An example off of the top of my head is how she helps me get ready in the morning (I’m not a morning person). She leaves for work before I even get up but she always kisses me goodbye. But even before that, Sami always packs me an awesome lunch and makes me a pot of coffee. Who does that?!?! Only someone who loves me a ton, that’s who." What keeps these two smiling? Sami says Drew has all these cutoff shirts that he wears, and she thinks it’s so funny. "My favorite is his white one from 6th grade—yep, he still wears it. I also love his flip-up sunglasses—yes, the kind that most people don’t wear until they are a bit more 'mature.' Also, one of Drew’s favorite things is to have a HUGE glass of milk before bed. We always have to have multiple gallons of milk in the house so he can have a nightly glass." Drew's favorite quirk about Sami is her affinity for old people. "She can’t even look at an old couple without saying, 'Drew, look at how cute that old man is! So adorable.'" They had me laughing with their "bad luck curse" story, too. They said that EVERY time they go out to eat, they find themselves laughing because the restaurant either doesn’t have what they ordered (literally, one restaurant ran out of white bread for Sami’s club), they forget part of their meal or bring them the wrong meal. "It might be angering to some, but we think it’s pretty funny and have learned to love it. It’s almost a game now." Cute quirks, making memories and laughing certainly keep their relationship alive! Sami said, "We are so excited about sharing the rest of our lives together. Knowing that we have truly found our soul mate and 'perfect person' is so exciting. We can’t wait to have our own family and see all that our future has to hold." 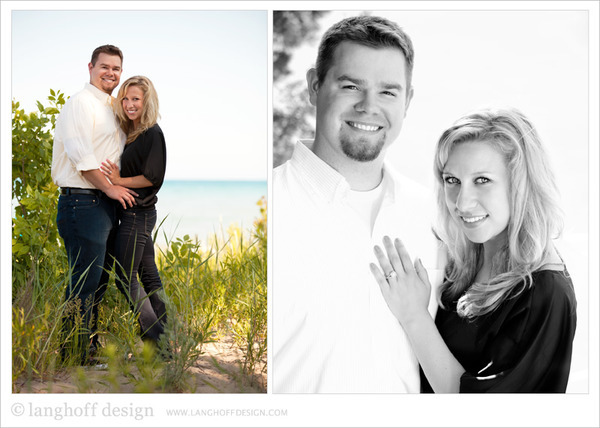 Their wedding date is set for June 8, 2013 at the Grand Ridge Resort in Lake Geneva, WI. They are expecting to have a fairly large wedding between 200-250 people. "So far, the wedding planning has gone extremely smoothly. We have been very on top of getting things done to prevent last-minute stress. It’s been great," Sami said. "We also have a great group of friends and family that have been super helpful (i.e our friends Amber and Chad who are our amazing photographers, my friend Maddy who is making the invitations, etc.)." Neither Drew nor Sami have gone on a tropical vacation, and their honeymoon will be the first time flying together. "We are not sure exactly where we want to go, but we are pretty set on an all-inclusive resort where we can lay out at a beach all day, have drinks brought to us, and eat delicious food." Pretty sure they'll have a great time no matter what! 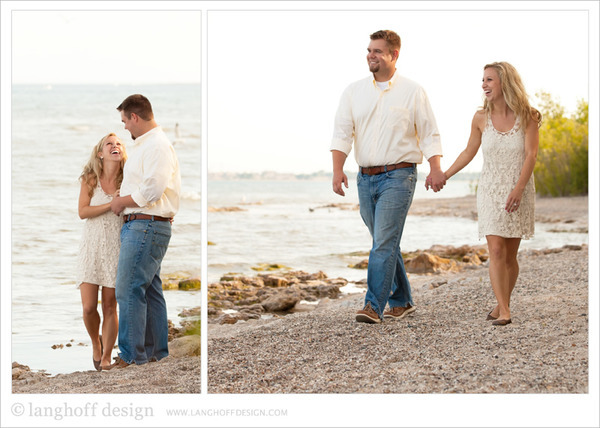 One of the things we love most about this couple is their ability to make absolutely anything fun. They are so playful together—and they love the Packers! They cracked us up as they changed up the mood with these funny sports pictures. So much fun! We're wishing them plenty of laughter and fun for a very happy engagement. 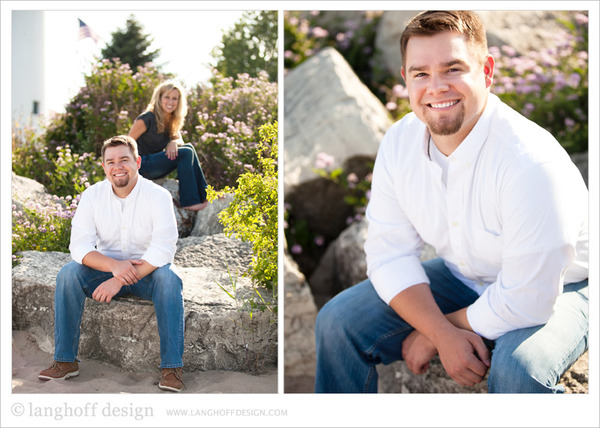 Sami and Drew, we are SO looking forward to celebrating with you and shooting your wedding!